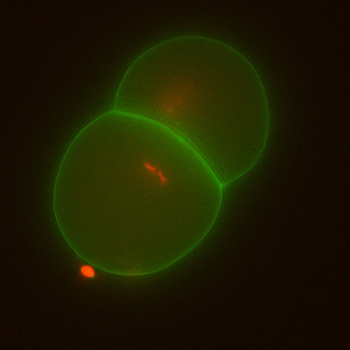 A two-cell embryo of C. elegans, stained to visualize DNA (red) and the cell membrane (green). One of the worst things that can happen to a cell is to end up with the wrong number of chromosomes. This can happen if something goes wrong during cell division, and it can lead to infertility, miscarriages, birth defects, or cancer. An estimated 30 percent of miscarriages are due to an incorrect number of chromosomes in the cells of the embryo. Cell biologist Needhi Bhalla studies how chromosomes monitor themselves throughout the complex choreography of cell division to prevent such errors. Her research focuses on a special type of cell division, called meiosis, which produces eggs in females and sperm in males. This process is radically different from the cell division by which ordinary cells multiply (called mitosis). "It's important to know how these basic biological mechanisms work so we can understand what happens when they go awry," said Bhalla, an associate professor of molecular, cell and developmental biology at UC Santa Cruz. "We know that having an incorrect number of chromosomes causes genetic disorders and birth defects. Understanding how that happens can help us prevent it or identify diagnostic markers so people will be in a better position to make decisions about reproductive health." When you consider everything the chromosomes have to do during meiosis, it's a wonder the process ever produces a viable egg or sperm. A key step, called recombination, involves chromosomes exchanging whole sections of DNA. It's like shuffling a deck of cards, and it's the reason siblings can be so different despite having the same parents. "Recombination involves deliberately cutting the DNA, so it's fraught, and it's super interesting how cells have evolved to deal with that. You've got an error-prone mechanism, and layered over that is a complex structure to limit errors," Bhalla said. Why is meiosis such an elaborate, error-prone process in the first place? As with most things in biology, the answer lies in evolution and natural selection. Sexual reproduction, with the shuffling of the decks through recombination during meiosis, generates the genetic diversity in offspring that is the raw material for natural selection. "Meiosis generates new genetic combinations, and natural selection acts on that. Everything we see in evolution is a product of what happens in meiosis," Bhalla said. The chromosomal monitoring system she studies involves a series of checkpoints to ensure that each step in meiosis is completed properly before the cell moves on to the next step. The checkpoints are molecular mechanisms that can halt the cell cycle until everything is in order for the next step, and they can even cause a cell to self-destruct if errors have occurred. In meiosis, there are a lot of steps to monitor. Most cells in the body have two sets of chromosomes, one set from the father and one from the mother. Egg and sperm cells have just one set of chromosomes so that fertilization, when egg and sperm merge, will produce an embryo with two sets of chromosomes. A key function of meiosis, then, is to accomplish that reduction to one set of chromosomes. It starts with the pairing of homologous chromosomes: chromosome 19 from mom pairs with chromosome 19 from dad, and so on. When homologous chromosomes pair up, they assemble a structure called the synaptonemal complex that holds them together. At that point, recombination shuffles the genetic decks as the two homologous chromosomes exchange sections of DNA. Then the synaptonemal complex breaks down and the homologous chromosomes segregate into two daughter cells. And that's just part one. "There is a checkpoint that makes sure the chromosomes are properly synapsed, a checkpoint that monitors recombination, another one that makes sure the chromosomes are attached to the apparatus that will separate them, and so on," Bhalla said. Part two of meiosis involves the separation of duplicate chromosomes. Before meiosis or mitosis gets started, all the chromosomes make copies of themselves, and the copies (called sister chromatids) are held together. During mitosis and the second stage of meiosis, the sister chromatids segregate into separate daughter cells. In a new study, published October 4 in Current Biology, Bhalla's lab studied a checkpoint molecule called shugoshin, which means "guardian spirit" in Japanese. Shugoshin was originally identified as important in meiosis for regulating how sister chromatids are held together at a structure called the centromere. 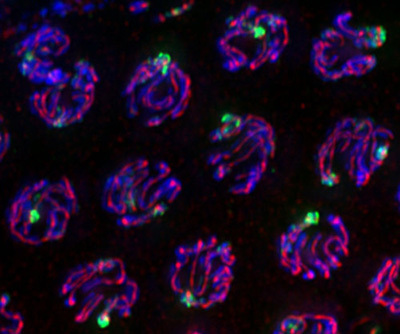 Bhalla's lab found that it actually plays a much wider role in meiosis, setting up the correct structure of chromosomes and ensuring the proper progression of recombination. "These proteins are multitaskers, and cells use them for multiple functions to make chromosomes do incredibly different things in different contexts," Bhalla said. Chromosomes hold an organism's genetic blueprint in their DNA, but the DNA is just one part of a highly complex chromosomal structure involving many different proteins with different functions, from packaging the DNA to monitoring the behavior of the chromosome itself. "Chromosomes participate in the monitoring of their own behavior. There's a beauty in that, because they are active participants where you would expect them to be passive," Bhalla said. "When you see cell division, with the chromosomes lining up and segregating, it seems like they are passive, but we know they are active participants, and their structure contributes to that." In addition to Bhalla, the coauthors of the new study include graduate students Tisha Bohr (first author) and Christian Nelson, and research technicians Stefani Giacopazzi and Piero Lamelza. This work was supported by the National Institutes of Health.